Advanced Low-E insulating glass windows and doors have two or three panes of glass with Advanced Low-E coatings and argon between the panes to block out 84 percent or more of the sun’s ultraviolet rays, increasing a home’s energy efficiency. Pella’s AdvancedComfort Low-E insulating glass with argon works the same way as their Advanced Low-E windows and doors, reducing the amount of UV rays that enter a house by 85 percent or more. Pella’s best choice for a cold climate is NaturalSun Low-E insulating glass with argon, which blocks out 69 percent of the sun’s ultraviolet rays but still allows heat to enter a home, reducing winter heating bills. For coastal communities that face the threat of severe storms, Pella offers HurricaneShield® windows and patio doors that can protect a home from flying debris, ultraviolet rays and noise and provide increased safety and security. Pella’s replacement windows are crafted with wood, fiberglass, or vinyl frames to match any homeowner’s needs, preferences, and budget. Wood is durable and requires little maintenance. Pella’s EnduraGuard® wood protection uses a formula that will protect your windows from moisture. The frames are protected by durable aluminum-clad exteriors that are treated with Pella’s EnduraClad® finish. Windows can be customized with your choice of wood types, colors, screens and other features. Pella’s fiberglass windows are crafted from Duracast®, a patented composite that is the strongest and most durable material available for windows and patio doors. It offers protection from exterior heat and cold, the sun’s ultraviolet rays and storm damage. Fiberglass windows and doors are also easy to maintain. 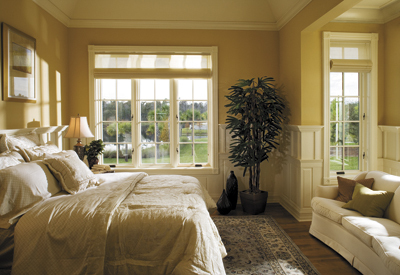 Vinyl windows from Pella offer easy maintenance and durability. They will look great for years and never need to be painted, stained or refinished. Pella’s vinyl windows resist weathering, warping, sagging, bowing and fading. Air chambers inside the vinyl reduce heat loss and sound transmission to keep your home comfortable and quieter year-round. At K.P. LaMarco & Associates, we install top-quality Pella replacement windows and patio doors on homes throughout Connecticut. Call us today at (203) 415-6773 to learn more about the many Pella options available and to request a quote.